San Vito lo Capo Cous Cous recipe. Sicily, Italy | Travel Blog & Co. 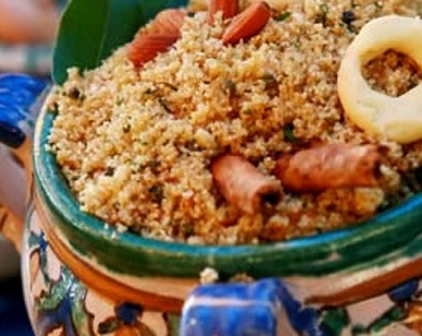 Prepared with semolina couscous as directed in the basic recipe and season with olive oil, chopped parsley, 2 cloves of garlic and half a chopped onion and a pinch of chili powder. Pour, and then in cuscusiera; seal the junction point of the two containers and cook for about 1 hour and a quarter. Wilt the onion in a pan with a bit of pepper and a little olive oil, add the sauce and cook. Cover with 3 l of water, salt and bring to a boil. Make a pesto garlic, almonds and parsley and mix the broth, then, add the fish to soup, already cleaned. Cover the saucepan and cook on medium heat for 25-30 minutes, so that the fish disintegrating make richer the broth. Turn off and let sit for half an hour, strain the liquid and set aside. Transfer the cooked couscous in “mafaradda” and sprinkle with plenty of broth, stir and let stand, well covered, for at least an hour. This entry was posted in Worldwide Recipes and tagged cous cous, culture, food, italy, life, nature, people, san vito lo capo, Sicily, trapani, travel by costanzafabbri. Bookmark the permalink.